After a few days on Google, I'm not able to find the right answer to my question. After reading a lot of scripting possibilities, then OpenVPN is up. I have a client running Debian 7.8, with OpenVPN 2.2.1 x86_64-linux-gnu. The connection is working great, and everything is fine. But - I need to mount some NFS-drives then the connection is initiated ("up" - I guess). See the full settings file here. As you can see, I have added "script-security 2" before the "up" and "down" commands. OpenVPN is running as root, and started by a init.d script, but even if I'm trying to run it with the full command, I get the same error. If I'm running the damn small script by myself, with both SU and Sudo, everything is going smooth without any issues. The point is that I need to run this command, to mount a few NFS-drives, but right now I'm locked down. So I need some help here - I did try on a Danish forum with no luck. The online manuels is not that helpful - and now I need your help. I ran into the same issue, luckily I found a solution. Just to make it clear: I forgot the "!" (exclamation mark). That's explain everything. 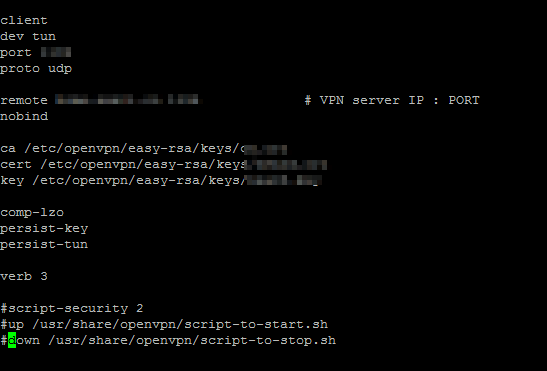 Check username under which openvp daemon is running and chown your script folder or file to it. Not the answer you're looking for? Browse other questions tagged linux debian vpn script openvpn or ask your own question. Should I be concerned about hacking attempts via wget on a CentOS/LAMP-based web server?